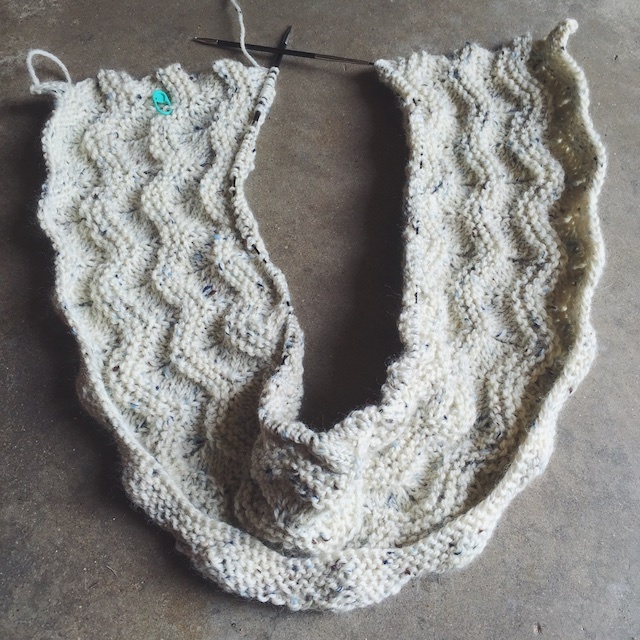 Here's some progress on my Blowing Snow Cardigan for the MidwesternKnits KAL. I really liked the yarn used in the sample, but my budget didn't allow for it at the time, so I went with something I felt had a similar vibe. It's just Patons Classic Wool Tweed. The little blue flecks are unexpected. I'd never looked carefully enough at this Patons color to notice them before. 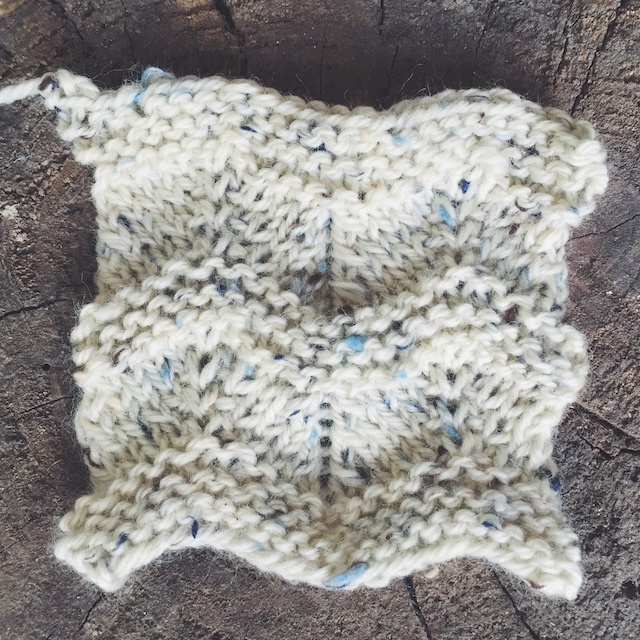 There are times when I think it's best to use a less expensive, workhorse yarn like Patons. Like when you've blown all of your "fun money" for the month and you realize a knit-along is about to start and you have no yarn for it. Or when Joann's is having a big yarn sale. 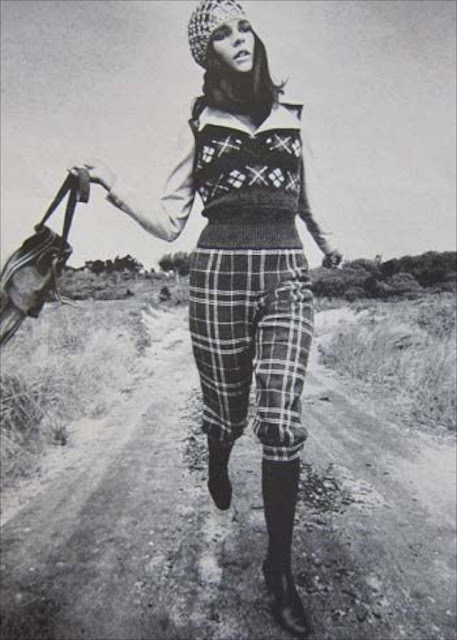 Or when you want a fun tweed because, really, Patons has some fun tweeds. Most natural colored tweed yarns don't have bright blue flecks in them. I think I would've chosen this yarn had I been able to afford a more expensive tweed. I realized, when knitting my second Beatnik, that I love boring old brown when it's knit with Paton's Tweed. There's all of these fun little yellow, green, and red flecks throughout. Their black tweed is the same way- flecks of red, green, and blue. A boring black turtleneck wouldn't be quite so boring in that. Then there's my whole tweed fixation. It's like I'm perpetually wanting to live in Ali McGraw's wardrobe ca. 1970. It doesn't matter that I rarely get to wear it. I've got a stockpile of Love Story- worthy sweaters anyway. I have big plans for my Midwestern Knits book. There's this cardigan, which I hope to focus on for the next couple of weeks, then there's the Furrowed Pullover and Furniture City. Both of which will be in yarn I'm excited to try. Eventually, I'd like to knit up some Riverwalk Mitts too, but my crafting plate is a bit full at the moment. All of the designs in the book have a KAL thread in the Ravelry forum, with staggered cast on dates. I don't know that I'll finish them within their KALs but I feel confident they'll be finished for cold weather. And it'll be just like I'm ready for my undergrad classes come this crisp New England Fall. Only, it will be alternating between 40º and 80º F in Texas... and I didn't finish college ...and I haven't been 24 for a while... but you get the idea.